It was a wild week with markets hitting major resistance levels and then failing on heavy volume. 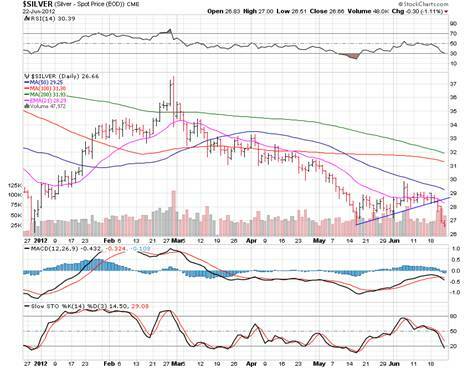 Gold and silver were rocked hard Thursday and was easy to see coming Wednesday. I didn’t short them unfortunately as it would have been a huge win for the day but there are some other areas that are working on the downside which are more predictable. The next week or two should be quite weak and we’re ready to take advantage of it. Markets move both up and down and when the trend is either up, or down I think the trend should be traded. Why sit by and watch the markets fall when you can make money at it? Learning to short markets using inverse ETF’s, options or even straight up stock is a key tool in a rounded investing quiver. It’s really not that different than trading on the long side, although a stock can only drop 100% while it can rise without limits in theory. Shorting is often just that. A short timeframe trade. Perhaps a few days to a week. The money can be huge, and fast, but full attention must be payed. 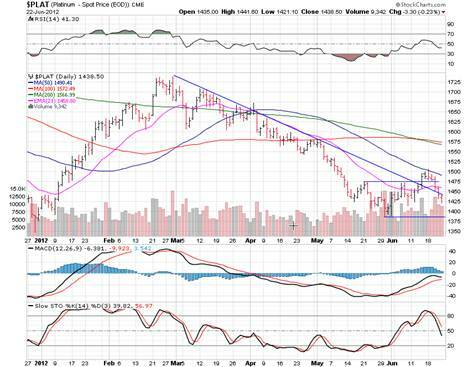 Gold fell 3.8% this past week, mostly on Thursday after Wednesday’s break of the uptrend line. It was a very ugly day out there Thursday and one best forgotten. It’s all paper games though and the physical remains under heavy accumulation. We know from recent history that heavy buyers are lurking at the $1,540 level and we will soon see if they remain there. $1,540 will be hit very soon but if it can’t hold then we could easily see a move to the support level down at $1,440. It’s not been that fun of a year yet but it could change. I did warn earlier in the year that we could well see the first down year since this secular bull market began. It’s a definite possibility but by no means would signal the end of this bull market. Both the GLD ETF and futures markets saw heavy volume on Wednesday and Thursday which says the bears are well in control for the time being. Silver really took the brunt of the pain this past week as it was clipped for 5.99%. It looks like we’re heading to the $25 level now where we can find support on the weekly chart from way back in 2012 unless this level holds right now. It’s been a tough year and looking set to get tougher. In 2008 I realized that I couldn’t be all in gold and silver and the shares so I began branching out. Now we hold a relatively small portion, about 10%, in mining shares. The rest is in physical gold and silver a swing trading portfolio and a very high paying dividend portfolio. I feel it’s very well rounded. I’m very glad at times like these that my exposure to other investments is substantial. We’ve still got a lot of upside to go in gold and silver but we may have to wait a little bit longer. Markets rarely do what we want when we want it, their job is to shake out as many as possible before making huge moves. The volume in the SLV ETF and futures markets were both very heavy and are pointing to further downside. Platinum reversed it’s breakout quickly and ended up down by 3.26% for the week. 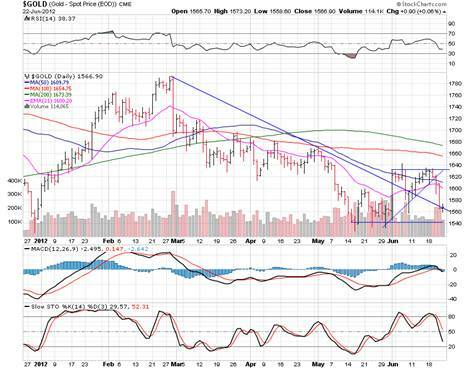 The metal just couldn’t best the 50 day moving average and with gold and silver falling, it fell hard as well. Now we have to look for support near recent lows around the $1,380 level. Volume on the PPLT ETF along with the futures market was heavy and pointing to lower prices still. 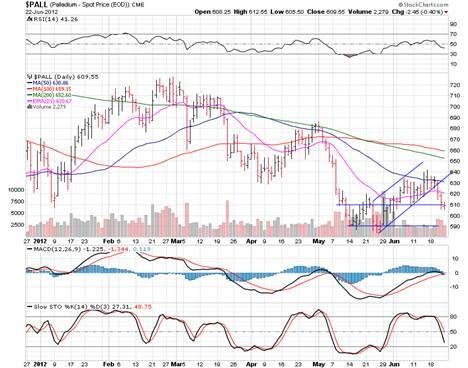 Palladium dropped 3.70% this past week after falling out of it’s rising channel. I just read what I wrote last week and I called for higher prices in palladium this past week. I’m not sure why, as rising channels such as this are most times a bearish pattern. We all make mistakes and that was an obvious one. Now it appears we’re heading back down to test recent support levels around the $590 mark at the very least. Heavy volume in the futures markets confirms that the metal will move lower while it wasn’t quite as strong on the PALL ETF chart, but it’s still seeing accelerating volume to the downside which is the recipe for lower prices. It was really no surprise to see the FOMC meeting end with no real changes. They are adding another $267 billion to their long-term bond holdings in what’s termed operation twist”. Thursday we saw a massive blanket downgrade of US banks which saw markets fall quite dramatically and set this move lower in motion in a big way. Friday’s snapback was on very light volume and had no conviction. Volume/conviction is what you must see in order for a move to work. The bank downgrades come just a little late, but what else is new. I really haven’t payed more than glancing attention to the ratings agency for years. Really, I don’t see why they are even still around since nary an investor really pays attention anymore. Bolivia has recently nationalized a tin and zinc mine. Now the company whom it was taken from is trying to seek some sort of adequate compensation package. Good luck with that! The dangers of investing in unstable countries is growing, but in life we do have to take some calculated risks and step outside of our box. It’s not always easy measuring political risk and even solid countries can turn on you such as Argentina has just done in the oil space. This has affected numerous other industries in the country who are operated and owned by outsiders. More and more countries are conducting currency swaps with China in order to skirt the use of the US dollar to conduct trade with each other. This time it’s China and Brazil who are set to swap some $30 billion. I’m hearing quite a bit about large central banks still accumulating physical gold on this weakness but it’s not being reported, at least not yet. Behind the scenes there is a massive battle taking place between the paper and physical market and from what I’m hearing the physical market is struggling mightily to keep up with demand. It really is just a matter of time until gold begins to trend higher again. Argentina is also now seeing a provincial governor trying to raise mining royalties from 3% to 8% and also hoping to impose law that mandates 80% of the workforce at mines must be local. I do agree that locals should be employed when they can but excessive and changing regulation will scare away companies which in turn will effect the local economy. It’s like the case of New Zealand cutting taxes and after a few rounds they didn’t know what to do with all the money they had! If things were made easier and cheaper for the small entrepreneur governments would be rolling in the cash. I’ve got to run to a nephews birthday party so I’ll leave it at that this week. I may be away next weekend and have no letter weather dependant. Until we speak again, play it safe out there, the markets are dangerous but the deals in gold and silver will reward you richly in the coming years from these levels or more likely even lower levels soon. Enjoy your weekend and week ahead.